I can’t say this was totally unexpected, and thank you for pulling the trigger on this and keeping us informed; it couldn’t have been easy. And especially thank all of you -Kevin, Tracie, Bruce – for a fun ride up to this point. I look forward to the (IhopeIhopeIhope) eventual return, and the suspension-of-disbelief-straining resurrection of Nightcap (though not holding my breath on that one). 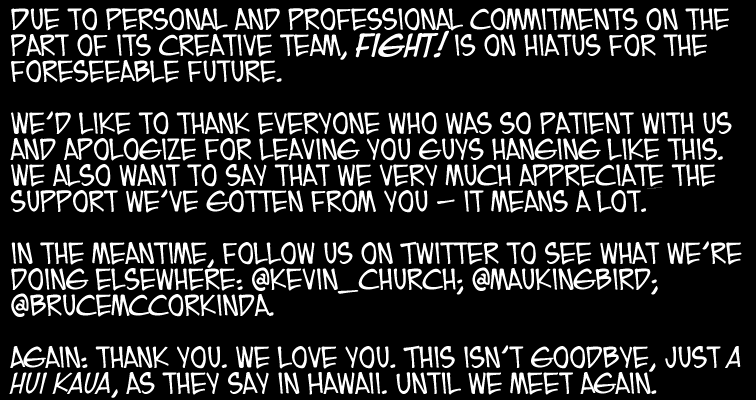 Just wanted to thank all of you for your hard work on this comic, it is greatly appreciated. Look forward to FIGHT!’s eventual return. Sad face. Thanks for the good comics, McKaukinadale. Aw man – that’s a huge downer. Thank you for all of the fun comics (and holding out hope for some future one-shot story)! Sorry to see it officially go on hiatus, and I hope it comes back someday! Aw… I just found this and I was getting interested. I hope it returns some time. Thanks, Really like this. Check out our website as well. Enjoy reading this. Do not forget to visit our website as well !